Welcome to all of our Zap Times subscriber family! At Best Zapper we promote Dr. Clark’s research and her methods. We carry the Auto-Zap zapper, Sync-Rho-Meter syncrometer, Food Zappicators and Tooth Zappicators. All are guaranteed for five years, and guaranteed to meet all of Dr. Clark’s specifications. Her new Prevention and updated HIV/AIDS books go into detail on these items. NEW! XanGo Juice Passes Syncrometer Purity Testing! Good news! XanGo mangosteen juice, our favorite health insurance, has passed a toxicity test using the Syncrometer. This is good news for those who, like us, are using this whole-food juice product for disease prevention and reversal. See more mangosteen information here. In April, 2004, my son, Jon, who was 27 years old, went to the doctor with severe -level 10 – Chest pain. They found a very large tumor in his chest – 21.5 cm X 17 cm. with a volume of over 300 cubic cm. It had collapsed his right lung. The middle lobe of that lung was necrotic and the tumor, which started under his sternum, was growing fingers up and out of his bronchial tubes into his throat. He was also very anemic. He was told that without therapy he had about 90 days to live. He agreed to begin ABVD Chemotherapy for Hodgkin’s lymphoma in May 2004. He was very ill with the Chemotherapy and was on Methadone as well as numerous steroids and other drugs. He was 6’3″ and weighed 170 and after his first dose of chemo lost down to 158 pounds by the second dose. His chemo was scheduled every two weeks but each time they would have to build up his blood with Nulasta for a week before they could administer the next treatment so it took eight months instead of 6 to get through the chemotherapy. During this time, I was intently researching – and finding – some herbal and alternative therapies hoping to find something that might help him through it. So, he talked to his doctor about taking herbs or other supportive natural therapies to support him through his Chemotherapy. His doctor told him “NO”…not to take anything else during chemo, not even vitamins! So, Jon didn’t. By the end of the chemo the tumor HAD shrunk to 4X7 cm. However, Jon was continuing to lose weight, and his general health was declining. He started Radiation in January 2005 every day for 21 days. When they made his tattoo marks permanent for the radiation he was told that it was because their lymphoma patients ALWAYS come back. At the end of the radiation the tumor measured 2X3cm and the Doctor said that it would not get any smaller and considered him in remission. FOUR months later his tumor was growing again quite aggressively this time and with additional spots on his left lung and higher lymph nodes stemming into his brain. He was scheduled for Stem Cell transplant at MD Anderson and chemotherapy every six months after that. However, he was not actually strong enough to endure it immediately, and also they had burned his esophagus really bad during the radiation and it was not healing very well so they wanted to give it three more weeks to heal and to allow him to “build up his strength”. He called me that afternoon and said “Mom I am ready to try those herbs, now”. I immediately got on the Internet to order the herbs and in that process I ran across Arthur Doerksen whom I called up on the phone to help me with a “zapper” from a cancer book I was reading. I had built one but was not very confident in it. He visited with me for a long while and told me about XanGo. I ordered some and Jon took a liberal 3-6 oz a day and by the end of the first week he felt MUCH BETTER. He said for the first time he felt like he was NOT on the edge of his life! As a matter of fact he was doing SO much better they postponed his Stem cell transplant for 3 months. He continued on the juice. Then, at the end of that time his tumor had shrunk 65%. Now, Jon didn’t want to upset the doctor so he hadn’t told him about the juice. So, the doctor was QUITE AMAZED about his sudden and radical improvement – without any chemo or Radiation. Last Friday his blood work was a “perfect One”! The Dr. said even his healthy patients don’t come back a perfect one! Certainly his lymphoma patients don’t. His protein was perfect, sodium/potassium perfect, white and red blood cells perfect. And the site where the tumor had been was now “unremarkable”! THEN he told him he could now have his once permanent chemo catheter port removed! But that wasn’t all, the doctor then told him that the next cancer he got would be in about ten years and it would be the result of the treatment he had received there. Jon’s feelings about that was “6 months and $1000 worth of this juice did for me what one year and 250,000 worth of traditional treatment couldn’t do. I am not going back in ten years because I’m going to keep drinking this juice!” And -for me – I have only to say that if I ever get to meet Arthur I am going to hug his neck! I have learned through all of this that there are lots and lots of folks just like me and Jon out here – just waiting for someone to “SHARE the goodness” with them! I am compelled to try just because I know. Thank you Arthur and Lyn from the bottom of my heart! You did for me and Jon this wonderful thing, (and we are not even in your “warm market”!!) We will be FOREVER grateful! God Bless You! Want to start spring right with a 90-day program to improve your health? Join Jon, Lyn and me in starting each day with the delicious power of XanGo mangosteen juice. It is the best health insurance we know. And the cheapest way to get it is wholesale direct from the manufacturer to your door. FOR THE MONTH OF APRIL, we will pay your $35 membership fee if you agree to try the juice for 90 days. This will give you full wholesale membership and distributorship privileges. Call us today to take advantage of our offer – the first time we’ve ever done this. We hope this gift will encourage you to do something delicious, easy and affordable for your health now. Call us today! Many who call us have read Dr. Clark’s books, but have not yet removed toxic household chemicals from their home. We cannot emphasize strongly enough: GET RID OF TOXIC CHEMICALS IN YOUR HOME! To help you with this, we have a free ebook for you on our website: Rebuild Your Health. We give you step-by-step instructions on how to clean your home of toxic chemicals. UPDATE 2011: Rebuild Your Health has been updated, improved, and totally re-written! 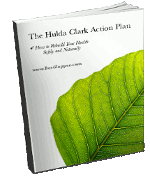 If you are looking to regain the health you deserve, and just need to get started on the right path, you’ll appreciate the easy recipes, checklists and informative instructions in our new eBook, the Hulda Clark Action Plan.Click Here to download the Hulda Clark Action Plan for free today! Did you know that good ol’ Windex is on Dr. Clark’s banned list? Read the ingredients, and you will see “Ammonia D.” Looks safe enough. BUT on an industrial Windex can Arthur saw these words: “Ammonia D is S.C. Johnson’s registered trade name for isopropyl alcohol.” Pretty misleading! It does not contain any form of ammonia, but pure Isopropyl Alcohol! Use a cup or two of vinegar in a bucket of water instead. Q – The Aluminum Foil for foot pads — I don’t use it, so I don’t have any. Should I get the ‘regular’ or the ‘Heavy Duty’, which is thicker and wider? A – Thicker is nice, and stronger. Get a roll of it. Q – How long a period does one Zap? Or, perhaps I should ask how many segments? Each segment (from what I’m gathering from the Instruction Sheet) is 7 minutes, followed by a 21 minute rest period and then repeated 2 more times? A – One “zapping session” is the full 63-minute cycle: 7-21-7-21-7-off. Q – Am I correct that the two foot pads or the copper pipe hand holds should not come in contact with each other? A – Yes, they must be apart for correct operation. But touching them together won’t hurt the Auto-Zap, and can be done to check that the wires are well connected and working. Touch them together and be sure that the top LED lights up. Q – I have a stainless steel cookie pan (about 15″ by 12″); okay to use that and place both feet on it? Or, does one have to use 2 separate ‘pads’ with each one connected to a copper clip? A – The single pan would short out the current. Two pads/hand holds are needed. Have you ever wondered why pharmaceuticals don’t work? By that, I mean that they don’t make people healthier. Sure, some pharmaceuticals can modify a measurable chemical marker, but they don’t make people healthier. We have 40 percent of the U.S. population on at least one prescription drug, yet our nation shows skyrocketing rates of all sorts of chronic diseases, like cancer, heart disease, type 2 diabetes, Alzheimer’s disease and osteoporosis. If pharmaceuticals work to make people healthier, we should be the healthiest nation on the planet. We have people here taking more drugs than any other nation in the world. The older you get in this society, the more drugs you end up taking. Many of our senior citizens are on a dozen prescriptions a day, and half of those are usually prescribed to cover up symptoms and side effects from the first few prescriptions. So why don’t drugs work? It’s because they make a promise they can’t keep. Prescription drugs make the promise — and this is reflected in the marketing — that a person can engage in a lifestyle filled with many factors that lead to chronic disease, but by taking one pill they can break that cause-effect chain and not experience the disease that would normally result. If drug propaganda were true, you could live a lifestyle that promotes heart disease by eating saturated fats while avoiding cardiovascular exercise, and the drug could prevent you from experiencing heart disease. All you have to do is take these drugs, says Big Pharma [the drug companies]. But diseases are brought on by causes, not by sheer luck or a deficiency in synthetic chemicals. This is a very simple concept, but it escapes most thinking in conventional medicine. These diseases have many causes, and some are dietary. There are metabolic disruptors in most foods — hydrogenated oils, sodium nitrite, saturated animal fats and homogenized milk fats. When you consume these disease-causing ingredients, you will experience certain results. Consuming unhealthy foods and avoiding healthy oils, like salmon oil, can lead to heart disease, nervous system dysfunction, birth defects and many other problems. But then a prescription drug comes along and promises that you can be disease-free regardless of the causes you have set into motion in your own life. These prescriptions are really marketed as magic bullet pills. “You have high cholesterol? Don’t worry about it! Take this cholesterol-lowering pill — this statin drug — and you will have normal cholesterol!” This implies that you will achieve a state of high cardiovascular health — a promise that is, of course, a lie. You are no healthier than before, even though certain measurable markers of your biochemistry may have been artificially altered. Your biochemistry has been hacked. A catastrophic drug safety trial which left six healthy volunteers fighting for their lives was the result of “a powerful pharmacological effect of the product in humans”, the UK government agency charged with investigating the incident said on Wednesday. The novel drug, called TGN1412, caused multiple organ failure in the six men injected with it at a Northwick Park Hospital, London, UK, on 13 March. Reports from friends and relatives describe the nightmarish symptoms suffered by the men. One man’s head was said to have swollen massively and his limbs turned purple. Another was said to resemble the deformed “Elephant Man”. Arthur’s Comment: The deadly drug substance TGN1412 is a new treatment for the devastating illnesses of leukemia, rheumatoid arthritis and multiple sclerosis. Why not simply use Dr. Clark’s zapping and cleanups, and an anti-inflammatory food like XanGo mangosteen juice, all proven safe, non-toxic and free of side effects? Tell your friends! How Many Cigars Equal One Pack of Cigarettes? New cigars for kids sport candy coatings, flavors. A report published in 2000 in the Journal of the American Medical Association said that smoking one large cigar causes just as much nicotine exposure as smoking a whole pack of cigarettes. Cigars are no different than cigarettes in their ability to cause cancer in the lungs and the upper digestive tract region. Place in large casserole dish and bake at 375 degrees for 20 min. until they are cooked but firm. Pour sauce over cooked yams. Garnish with peanuts if desired. That wraps it up for this time! Thank you for allowing us into your home again. If you have any specific questions we can personally answer for you, please contact us. FREE INFORMATION: We have some small brochures for anyone seriously interested on the following topics: Cancer, Arthritis, Diabetes Type II, Heart Attack and Stroke, Fibromyalgia, Inflammatory Bowel Disease and Diverticulosis, Multiple Sclerosis, Asthma, COPD and Allergic Rhinitis. Email us with your address and phone number. Note, there is a limited supply.